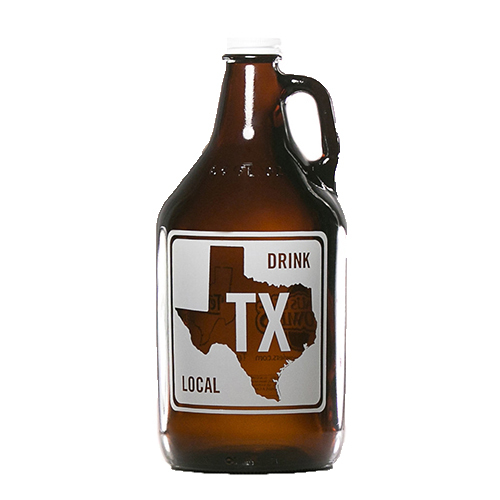 Drink up to your home state with the Texas Bike Chain Growler 64 oz (HG-BC47) in hand on your next night out. This growler has a classic design in amber glass. 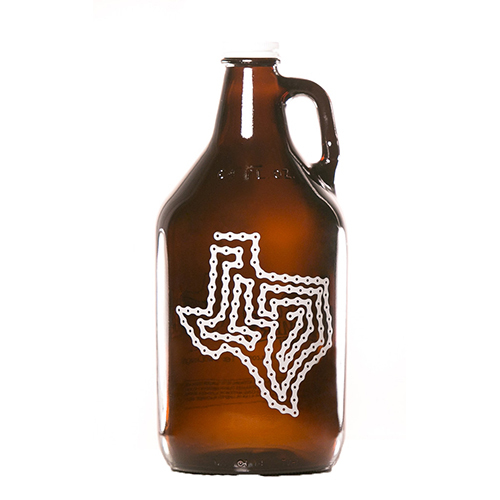 It features Texas formed from a bike chain printed in white, perfect for the craft beer-drinking cyclist in your life. It can hold up to 64 ounces and features a screw-on cap and built-in handle for easy transport.Fun: This growler features Texas formed from a bike chain printed in white.Classic: With a classic growler design in amber glass, it can hold up to 64 fluid ounces.Convenient: For easy transport this growler has a screw-on cap and built-in handle. 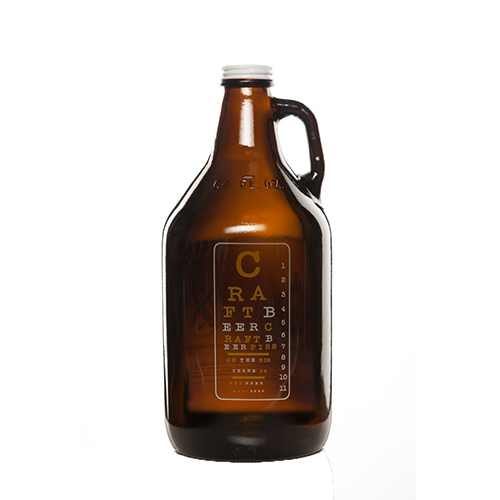 Fill the Eye Chart Growler 64 oz (HG-EC11) with your favorite beer for an evening in good company. This growler has a classic design in amber glass. It features a fun and helpful eye chart to gauge yourself through the night. It can hold up to 64 ounces and features a screw-on cap and built-in handle for easy transport.Fun: This growler features a fun eye chart to help gauge yourself through the night.Classic: With a classic growler design in amber glass, it can hold up to 64 fluid ounces.Convenient: For easy transport this growler has a screw-on cap and built-in handle. 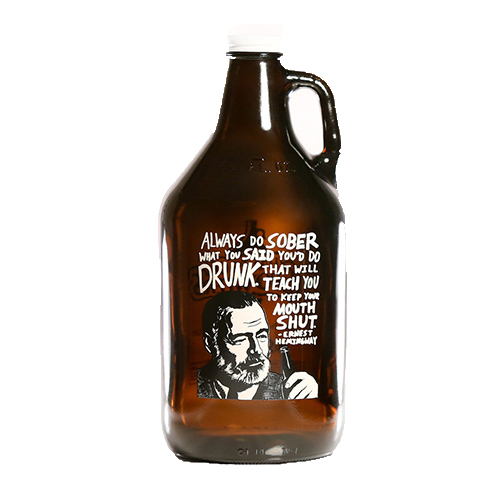 Throw some back in good company with the Hemingway Quote Growler 64 oz (HG-EH20) at your next gathering. This growler has a classic design in amber glass. Ernest Hemingway provides some life lessons quoting, ????? ?Always do sober what you say drunk. That will teach you to keep your mouth shut,?????? inscribed with his likeness accompanying. It can hold up to 64 ounces and features a screw-on cap and built-in handle for easy transport.Inspiring: This growler features a thought-provoking quote from Ernest Hemingway with stylized likeness to accompany.Classic: With a classic growler design in amber glass, it can hold up to 64 fluid ounces.Convenient: For easy transport this growler has a screw-on cap and built-in handle. Prepare for a bit of a gonzo evening with the Thompson Quote Growler 64 oz (HG-HT19) in hand at your next gathering. This growler has a classic design in amber glass. Take a hint from Hunter S. Thompson with his quote, ????? ?Good people drink good beer,?????? inscribed with his likeness accompanying. 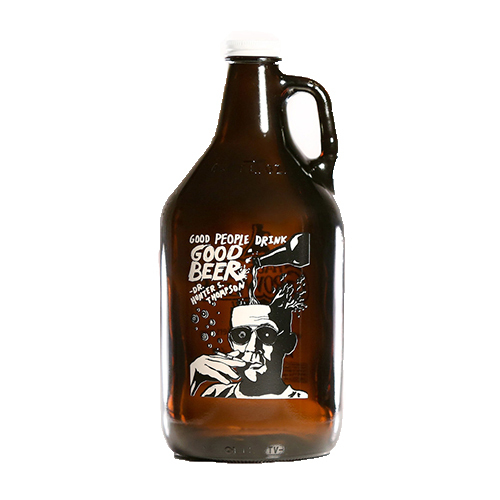 It can hold up to 64 ounces and features a screw-on cap and built-in handle for easy transport.Inspiring: This growler features a thought-provoking quote from Hunter S. Thompson with stylized likeness to accompany.Classic: With a classic growler design in amber glass, it can hold up to 64 fluid ounces.Convenient: For easy transport this growler has a screw-on cap and built-in handle. 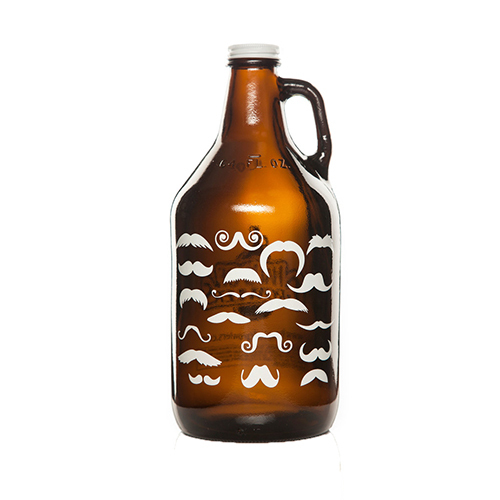 Tip one back with the Many A Stache Growler 64 Oz (HG-MS07) filled with your favorite beer for an evening in good company. This growler has a classic design in amber glass. It features a fun collection of various mustaches printed in white. It can hold up to 64 ounces and features a screw-on cap and built-in handle for easy transport.Fun: This growler features a collection of mustaches printed in white.Classic: With a classic growler design in amber glass, it can hold up to 64 fluid ounces.Convenient: For easy transport this growler has a screw-on cap and built-in handle. 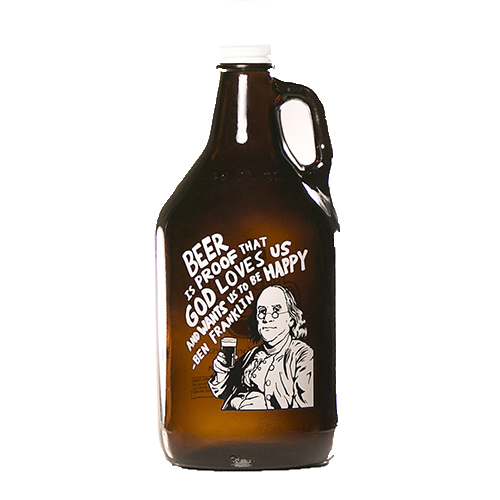 Enjoy your favorite beers with the Franklin Quote Growler 64 oz (HG-NBF34) in hand at your next gathering. This growler has a classic design in amber glass. It????? ?s hard to disagree with Benjamin Franklin quipping, ????? ?Beer is proof that God loves us and wants us to be happy,?????? inscribed with his likeness accompanying. It can hold up to 64 ounces and features a screw-on cap and built-in handle for easy transport.Inspiring: This growler features a thought-provoking quote from Benjamin Franklin with stylized likeness to accompany.Classic: With a classic growler design in amber glass, it can hold up to 64 fluid ounces.Convenient: For easy transport this growler has a screw-on cap and built-in handle. 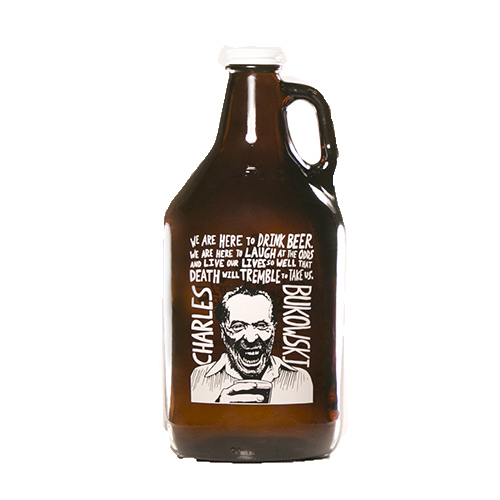 Enjoy a night of drinks in good company with the Bukowski Quote Growler 64 oz (HG-NCB35) in hand. This growler has a classic design in amber glass. Writer Charles Bukowski beckons you to raise your glass quipping, ????? ?We are here to drink beer. We are here to laugh at the odds and live our lives so well that death will tremble to take us,?????? inscribed with his likeness accompanying. It can hold up to 64 ounces and features a screw-on cap and built-in handle for easy transport.Inspiring: This growler features a thought-provoking quote from Charles Bukowski with stylized likeness to accompany.Classic: With a classic growler design in amber glass, it can hold up to 64 fluid ounces.Convenient: For easy transport this growler has a screw-on cap and built-in handle. The Ratpack Quote Growler 64 oz (HG-RP53) is just the way to enjoy your favorite beer. This growler has a classic design in amber glass. Raise your glass to Frank Sinatra with his quote, ????? ?I feel sorry for people who don't drink. When they wake up in the morning, it is the best they're going to feel,?????? inscribed with his likeness accompanying. It can hold up to 64 ounces and features a screw-on cap and built-in handle for easy transport.Inspiring: This growler features a thought-provoking quote from Frank Sinatra with stylized likeness to accompany.Classic: With a classic growler design in amber glass, it can hold up to 64 fluid ounces.Convenient: For easy transport this growler has a screw-on cap and built-in handle. Show your pride with the Texas Road Sign 64 oz (HG-RS45) in hand on your next night out. This growler has a classic design in amber glass. It features a bold Texas road sign print urging you to ????? ?Drink Local??????. It can hold up to 64 ounces and features a screw-on cap and built-in handle for easy transport.Fun: This growler features a bold Texas road sign print in white.Classic: With a classic growler design in amber glass, it can hold up to 64 fluid ounces.Convenient: For easy transport this growler has a screw-on cap and built-in handle. Harken back to your original Texan roots with the Republic of Texas 1836 64 oz (HG-RT14) in hand on your next night out. This growler has a classic design in amber glass. It features the historic borders of the Republic of Texas from 1836 in red and white. It can hold up to 64 ounces and features a screw-on cap and built-in handle for easy transport.Fun: This growler features the historic Republic of Texas borders from 1836 printed in red and white on the side.Classic: With a classic growler design in amber glass, it can hold up to 64 fluid ounces.Convenient: For easy transport this growler has a screw-on cap and built-in handle. 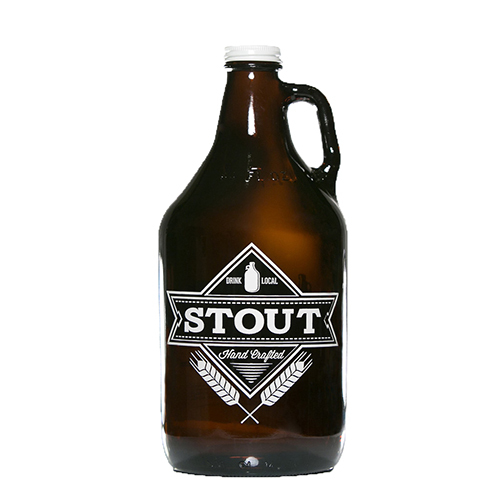 Let your homebrew shine with the Stout Beer Style Growler 64 oz (HG-S57) in hand on your next night out. This growler has a classic design in amber glass. It features a bold stout beer logo printed on the side letting everyone know you????? ?re enjoying a hand-crafted brew. Holding up to 64 ounces of your favorite brew, this growler features a screw-on cap and built-in handle for easy transport.Attractive: This growler features a bold hand crafted stout beer logo great for any homebrewer.Classic: With a classic growler design in amber glass, it can hold up to 64 fluid ounces.Convenient: For easy transport this growler has a screw-on cap and built-in handle. © HomeBars.com 2019. All right reserved.